← Shootout Game Theory: Should Shooters Want Goalies Guessing? Does Pace of Play Affect Shooting Percentages? JP of Japers Rink had an interesting piece a while back about the idea of increasing pace of play. He explored the topic of whether a team should ever attempt to push the play or slow it down in order to give it the best chance of winning against a particular opponent. Event rates are important because a 55% Corsi For Percentage is very different for a team that averages 110 Corsi events per game (for and against) compared to one that averages 90. The 2005-2006 Detroit Red Wings are an example of the former, the 2013-2014 New Jersey Devils of the latter. A team with a higher event rate with a positive shot attempt differential will end up on average with a better goal differential and likely a better record than one with a lower rate but the same differential. The big question the piece raised for me, however, was whether pace of play can have an effect on shooting percentage. After all, we know that the score can affect shooting percentage based on the change in a team’s tactics and mindset. Is there a shooting-related reason why high event hockey might not be preferable? I looked at team-level data since the 2004-2005 lockout, compiling each team’s Corsi For Percentage, Corsi Events For and Against Per 60 (Corsi Pace), as well as shooting and save percentage averages and differentials. 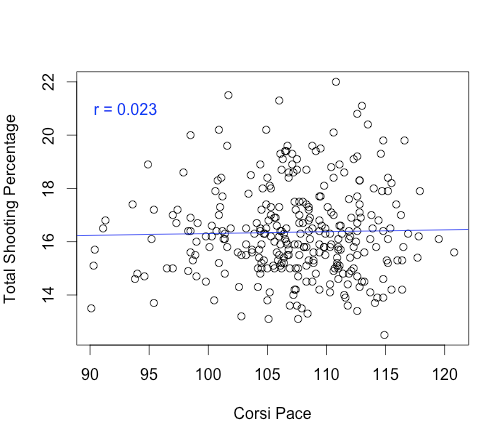 Here is a graph of Corsi Pace versus team total shooting percentages (for and against added up). And here I looked at the percentages as a differential. Does higher pace lead to better differentials? Looking at shooting and save percentages individually doesn’t yield much better. Overall, it just seems as though pace of play doesn’t largely impact shooting percentages, so good high event teams may legitimately be better off than good low event teams. 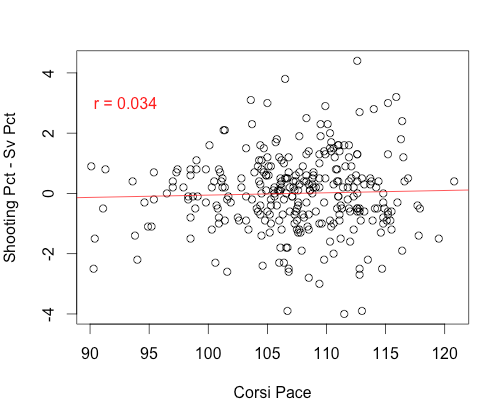 This entry was tagged analytics, Corsi, nhl, pace of play, shooting percentage. Bookmark the permalink.